November 30th, 2016 | News and Events, Wheaton World Wide Moving. Direct Lease Driver of the Month, Jason Jacks, Mooresville, Ind., has more than 24 years of experience as a professional household goods mover. He maintains a top driver rating with no claims. This is Jason’s first Driver of the Month award with the van line. Tawfeq Ahmed, All Brunswick Van Lines, Inc., Dayton, N.J., earned Wheaton’s Permanent Fleet Driver of the Month award. 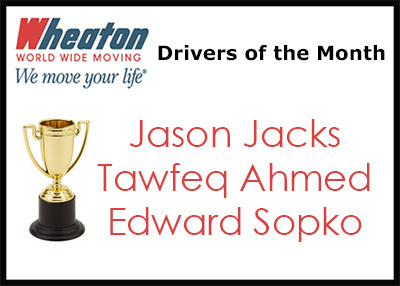 He has more than nine years of experience as a professional mover and this is his first Driver of the Month award. Edward Sopko, Olympia Moving & Storage, Inc., Alexandria, Va., earned Wheaton’s Intermittent Fleet Driver of the Month award. Ed maintains an excellent performance rating and has more than 35 years of experience as a professional mover. This is his fifth Driver of the Month award.